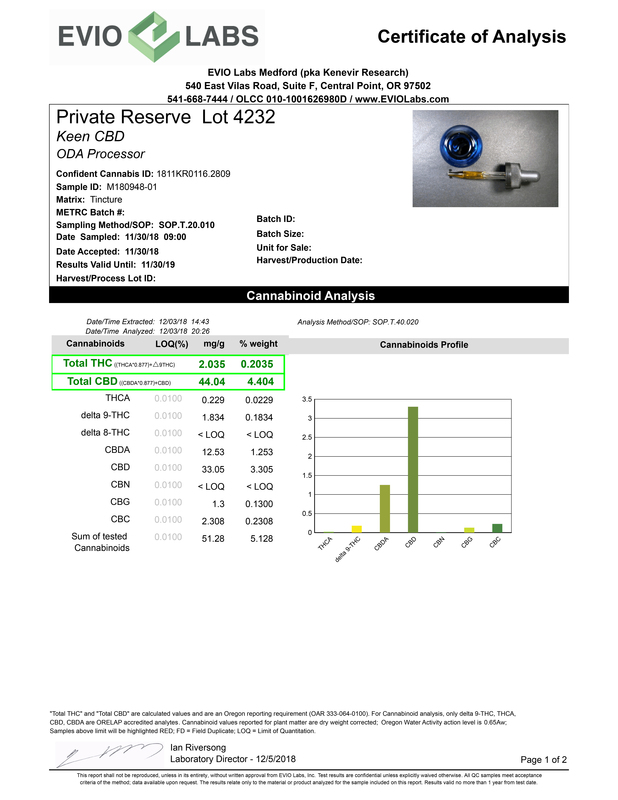 We do all of our finished product testing, and raw material impute testing with Evio Labs (formerly Kenevir Research), 540 E. Vilas Rd., Suite F, Central Point, OR 97502, (541) 668-7444, www.kenevirresearch.com We also will post testing results from our raw material supplier/s when applicable. Lot 4230 Each cookie has 2 drops of our Private Reserve Tincture. Equal to ~2.32 mg of CBD per cookie. Lot 4232 Each cookie has 2 drops of our Private Reserve Tincture. Equal to ~2.20 mg of CBD per cookie. Due to changes in the regulatory environment as well as the growth of the industry, our testing lab has been making it's reporting better and better, but it has changed a little over time. Thus we list the best info we have, but we recognize it might be a little confusing for those not in the industry. Have a question? Please shoot us a line info@keenCBD.com - thanks!